Hearty, thick, creamy, chunky and delicious, this chowder will satisfy even the soup-hating, omnivorous eater. Put cashews and non-dairy milk in blender and let them sit while you prep veggies and get the soup going. Saute onion in large soup pot until soft; add garlic and cook 1-2 minutes. Add potatoes, carrots, celery and broth to soup pot; bring to a boil, lower heat and simmer about 5 minutes; add broccoli to pot and simmer until just tender. Meanwhile, to the blender, add the remaining ingredients along with 4 cups of the hot soup. Process until smooth and pour back into soup pot. 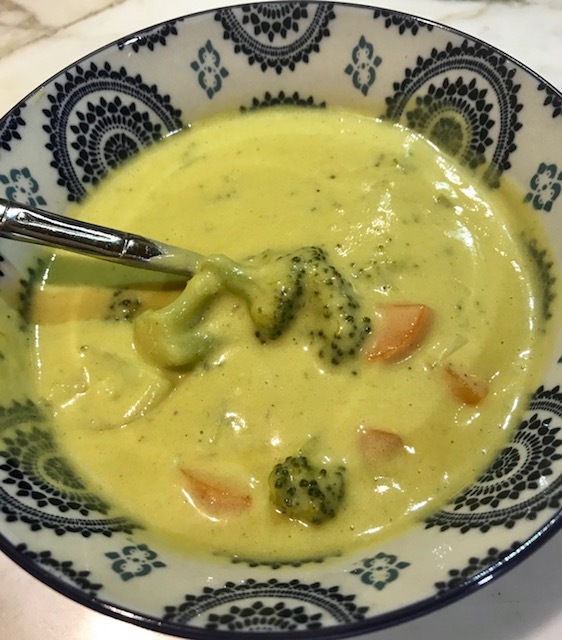 This entry was posted in Recipes and tagged broccoli, chowder, gluten-free, potato, soup, vegan by Shelly Detken. Bookmark the permalink.